If you’ve been to a meeting, you’ve heard the VBEs talk about the ABCs of babywearing. We start every meeting this way because whether you’re brand new to babywearing or a seasoned wearer, these are great reminders. A is for Airway. We always, always, always want to make sure that baby can breathe easy in the carrier. We don’t want baby to be chin-to-chest because it can pinch off baby’s airway. (To see what we mean, put your chin to your chest and try to breathe. Go ahead! Not really comfortable, right? And babies don’t even have the muscle development you do, so it’s even worse for them!) 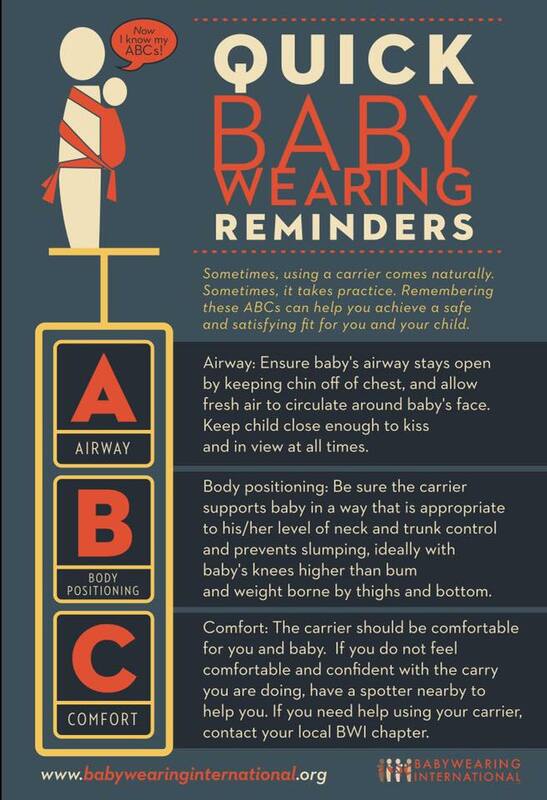 You also want to always have a clear sight of baby’s airway and make sure that the carrier (or your clothing) are not impeding fresh air from circulating around baby’s face. B is for Body Position. You want to make sure baby has a nice, neutral spine. Baby should have enough support that they’re not slumping over, but not so tight that they’re unnaturally straight. Baby should be in the seated “M” position, with baby’s knees higher than their bum, and the carrier should support baby from knee to knee. C is for Comfort. You should be comfortable. Baby should be comfortable. If you’re not, let’s fix it. Bring the carrier with you to a meeting and we can help you tweak your carry to make it more comfortable, or you can browse our lending library and try out some other options. Can’t make a meeting? Post some pictures to our Facebook group and we’ll try to help with some virtual tweaking!